The opening of a celebration of Friars (does that sound like a collective noun? ), the iconic Aylesbury music club, with over 93,000 members, myself included, at the towns Museum on Friday night was so brilliant that we decided to go back as paying customers yesterday morning to have another look. In no way could that decision be construed as egotistical, because they are only a mere half a dozen references to my good self and the joy I helped to bring to music fans in the 70’s. It was a similar kind of joy as that which I provide nowadays to anybody I sign up for an account with Currencies Direct. If one were to nitpick, and only one person could possibly be concerned, there were a few errors and omissions. It was acknowledged in one section of the exhibition that I was the first to put on a show locally by The Clash (at the Tiddenfoot Leisure Centre in Leighton Buzzard! ), but the there was no credit for my putting on The Jam at the Hunt Hotel in the same town, before they moved on to bigger and better things at Friars, but who, apart from me, would care? After some early retail therapy for That Nice Lady Decorator in Aylesbury, it was my turn to indulge myself with a second visit to this splendid exhibition, this time not distracted by bumping into so many old friends. 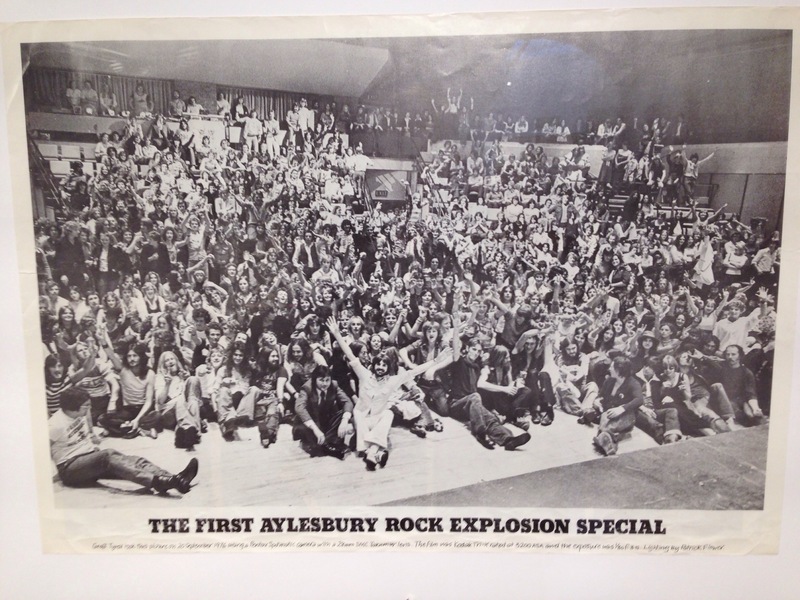 I am publishing one more picture of it, today in this column, but have decided that I have so many, although not that good, I am going to create a different web site of pictures dedicated to the Aylesbury music scene in the seventies, and starting with the photos I took yesterday. Watch his space. It might have been built today, but lunch is booked at JAK, the new restaurant at the White Hart with Colin the Pirate and his sultry goddess Sandra, so I suspect I shall be incapable of doing anything meaningful by late afternoon. Last night, after driving back to a rather spring like Arundel, and a late afternoon traipse around the Cissbury Ring in some pleasing sunshine, we arrived home to find that starving child Sprog 2 had arrived back unexpectedly and was disappointed that there was no food in the house. This statement ignored the array of tins of various foodstuffs, the cold chicken, tuna, pasta, bread, vegetables, biscuits fruit and cheese which were lying around. It appears we had no ham for her customary ham sandwich, which was of course an oversight, which, had we been warned she was coming, might have been avoided. There was only one thing for it. We decided to try to deal with this starvation and treat her to a curry at the Kings Arms last evening. Terribly Tall Timothy Taylor popped in whilst doing his customary rounds of all the pubs in Arundel and for some reason we discussed Friars, as he is an old music head, and then conversation turned for some stranger reason to John Otway. I was telling him that John is proud of the fact that he has never repaid or recouped an advance from a record company in his 40 year career, which prompted the immortals line “John Otway has stitched up more record companies than Frankenstein”. I would like to claim it as my own but I suspect Mr Taylor would fight me if he found out, but as he has said he will never read this column, I think I will. Far too nuanced to capture in rhyme. Doesn’t stop me trying though! Looking forward to seeing the other pictures.